WARNING: The following article contains major spoilers for the web drama Flying Tiger, which premiered on April 6, 2018. Shaw Brothers’ web drama Flying Tiger <飛虎之潛行極戰> is in for a long ride. 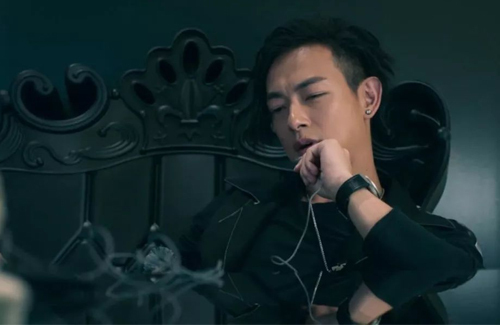 Within an hour of its double-episode premiere on China’s Youku and Hong Kong’s myTV SUPER, the police action drama surpassed 100 million views, and has become a trending topic of discussion in Hong Kong. The cast of Flying Tiger have all shared their excitement for the drama’s success, and are more confident than ever to see bigger numbers in the future. Flying Tiger stars Michael Miu (苗僑偉), Bosco Wong (黃宗澤), Ron Ng (吳卓羲), Eddie Cheung (張兆輝), and Michael Wong (王敏德) as members of the Hong Kong Police who are warped into a revenge plot. 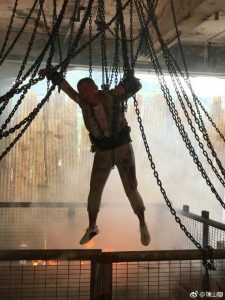 Although it’s only been a few episodes since its April 6 premiere, Ron, who stars as Senior Inspector Marcus Ko of the OCTB, has already made headlines for his daring jump stunt in the premiere episodes. Ron wasn’t the only star of the show. Oscar Leung (梁朝偉) has also been turning heads for his hysterical performance of Kenny, a young man obsessed with studying the human mind and finding the perfect ways to murder. In the show, Oscar tortures guest star Joel Chan (陳山聰), who plays an undercover cop, to his death. Shocked by his death, not many netizens were expecting Joel to have such minimal screen time on the show. Is that a shock? china have more than10 billions of ppl its not difficult to reach such ratings. many tvb web dramas already surpasses thousand millions of views. it say nothing about the quality of this drama. @littlefish True, the numbers are wrong (world population is around 7.6 billion currently, with China taking up approximately 1.4 billion of that number), but @kolo still has a valid point – 100 million views is nothing compared to the huge population that China currently has. Also, when compared to the even bigger numbers that other HK series airing in China were able to achieve (reference my comment below), the 100 million number is really not worth shouting about…. @flakpanzer40 Yes, 100 million within an hour is impressive, however if we take into account TVB’s (Shaw Bros’) promotion machine, it’s technically not THAT impressive. TVB’s own series in HK usually get high ratings for each first episode, since everyone will likely tune in to see what’s up, especially if TVB has been hyping the series (the “hype” for Flying Tigers had been going on even before the series finished filming), but then ratings usually fizzle as the series drags on…..the true test is whether the ratings (in this case, the high view counts) are sustained and continue through to the end of the series. @llwy12 I think 100million views for a web drama for the first hour is very good. Haven’t seen it yet, will give it a go though. So 100 million is equivalent to 1/14 of China’s population. In the modern era 1 billion is no longer 1 million x 1 million, which would be an astronomical figure. If China really had that large a population it would have collapsed by now. looks like a good show from watching the trailer. The plot is typical recycled TVB garbage. I admit that I am watching this drama, but not for the story, rather for the acting of veteran actors (Eddie Sheung, and Hugo Ng). Ron Ng, Bosco Wong, and Michael Miu are playing the same characters at TVB for the past 15 years (yes I know this is a Shaw Brother’s production, they own TVB). Ron’s acting hasn’t improved at all since he left TVB – plays the same hot-tempered character in every cop drama. Bosco’s role is more or less the same, nothing out of the ordinary. Joel’s role is surprising as he died off faster than anticipated. Oscar is getting more screen time than I thought. @littlefish @anon Unfortunately, there aren’t that many veterans worth watching in Flying Tiger, at least not in the main roles. Aside from Michael Miu and Eddie Cheung, the only other veteran worth tuning in for is Hugo Ng, however with that said, he had a much bigger and “badder” (and all around better developed) role in OCTB so not watching him in this series doesn’t really matter IMO. I would honestly much rather watch the veterans in OCTB, especially since most of them were not only formidable actors/actresses in their own right, they were also artists whom we hadn’t seen back on HK television screens in a LONG time (I’m talking 20+ years for some of them). @anon Oscar’s role as a twisted killer is a refreshing change. Ron still plays the 冲动 police officer….boring. Joel shouldn’t have been killed off so soon. Michael Wong’s Cantonese sounds weird. My favourite is Michael Miu. 100 million views actually isn’t that much nowadays for a series airing in Mainland. Considering the fact that China currently has a population of 1.43 billion, 100 million views is only a small scratch on the surface (if we do the math, that’s a little less than 7% of the population watching). So yea, if and when Flying Tiger is able to achieve OCTB numbers, THEN Shaw Bros / TVB can “brag”….until then, it’s nothing more than the “typical” TVB formulaic series with what amounts to “normal” ratings in Mainland.